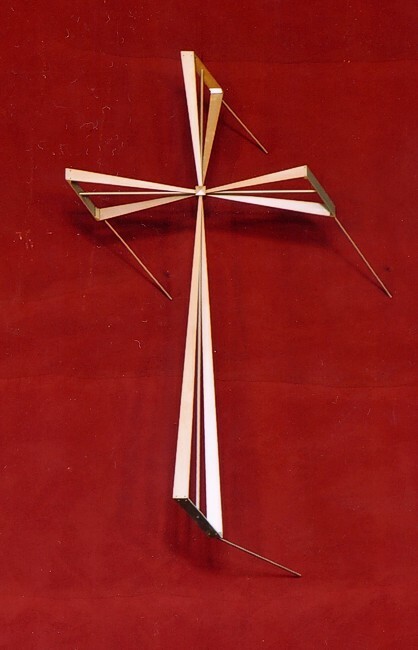 There is a modern metal cross mounted on the east wall above the main altar. 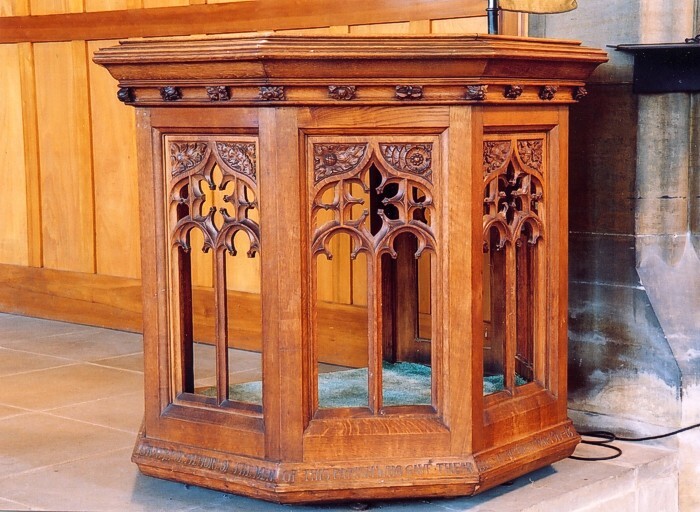 Light oak, Gothic fretwork, hexagonal, height 3 ft 9 ins x 4 ft across. 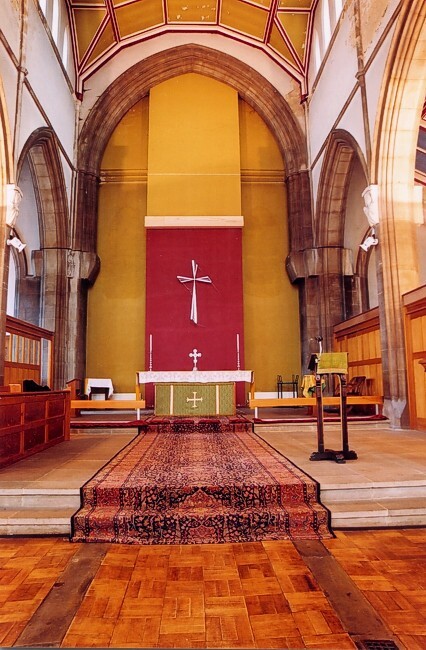 Originally, in 1923, it stood in the north east corner of the choir, on a stem which was removed in 1966, when the pulpit was moved to the south west corner of the choir. 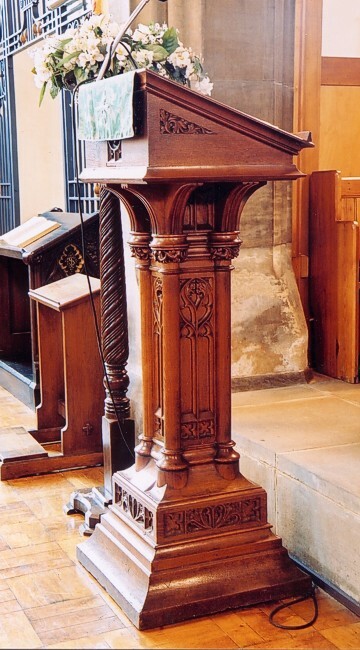 The pulpit was given as a War Memorial following the First World War. Installed on the east wall behind the altar in 1948 but moved to the Side Chapel in 1966. Dedicated as a Second World War Memorial in dark oak. 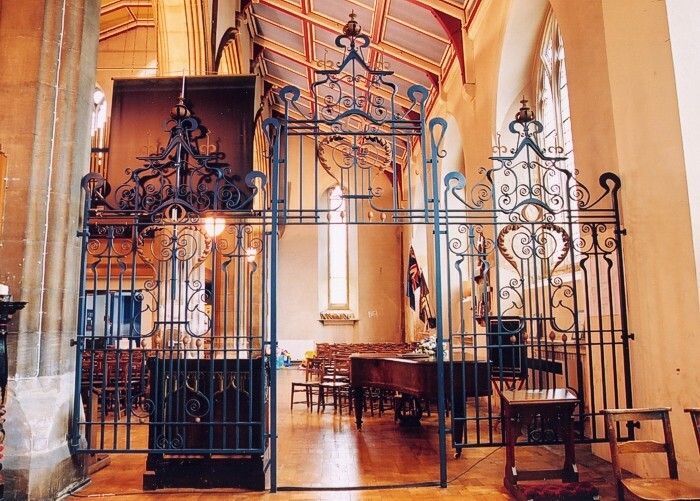 Wrought iron gates were brought here from Basford Hospital when it closed, and were fashioned into a screen by Cyril Blades of Hickling Pastures. They were dedicated on March 25th 1967 by the Bishop of Southwell. 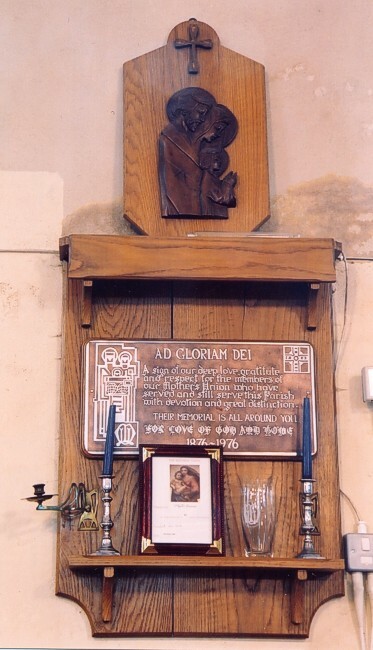 Made of light oak by a friend of Father Crowie (then St Aidan’s vicar) and put up in 1976. It is fixed mid-way along on the north wall. 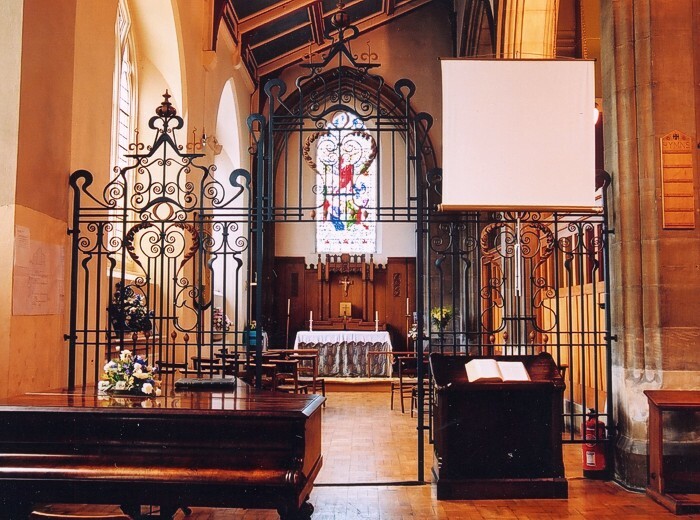 In the north east corner of the Side Chapel, mounted on the wall, is a brass sanctuary lamp, given in 2003 in memory of Phyllis Barnett, a life-long member of the church. The present font is portable, and is 3 ft high x 1 ft 3 ins square at the top. The stand is made of light alloy and the top is light oak with a chrome steel bowl. It was presented by Mrs. Clifton in December 1972 and bears a small plaque with the words: ‘To the Glory of God and in memory of Reginald Clifton, Churchwarden 1943-57'. The original font was hexagonal and plain, of light coloured stone, standing in the north west corner of the north aisle. It was due to be removed in the re-ordering of the 1960's but was reprieved until the present one could be finished in 1972. Eberlin & Partners, architects, produced drawings for a rather ornate font in the re-construction, but it was rejected due to cost and being out of keeping with the simplicity of the finished church. 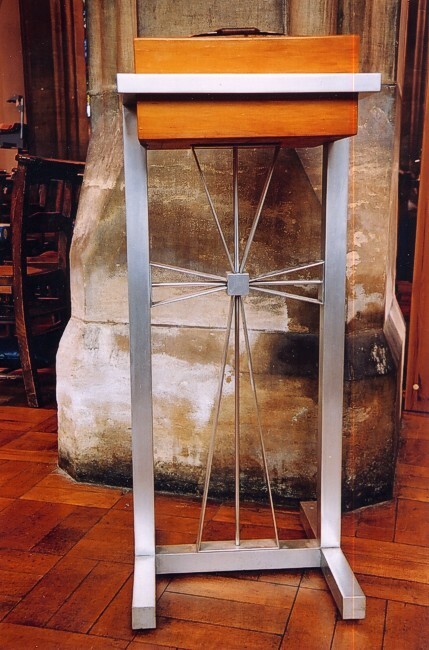 A plan to construct a font from the base of the pulpit in 1967 never materialised either. and scholars and other friends. 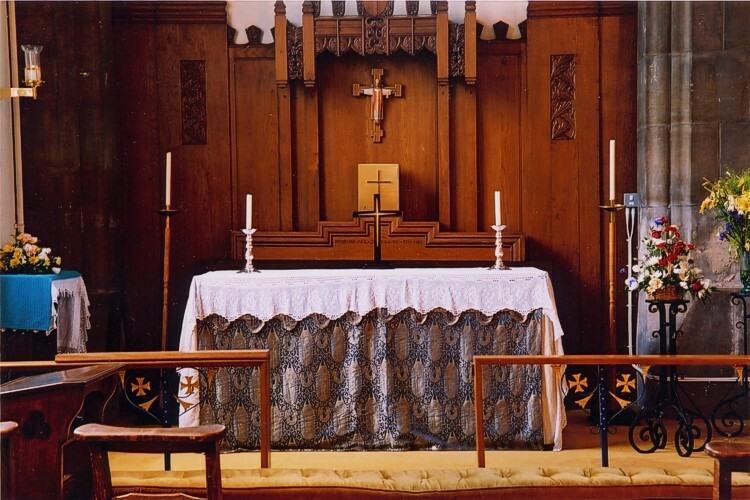 These sanctuary desks apparently came from St Augustine’s, Basford after it closed. The Gift of their parents, brothers & sisters.